In the past year, the big buzz in the world of nail polish has been shellac. It’s a special type of nail lacquer and process that’s supposed to last, chip-free, for two weeks. Sounds too good to be true, right? As a DIY manicurist who keeps her fingernails polished about 350 days of the year, I was intrigued. Hiatus Spa + Retreat (where I have a membership) offers an alternative to the shellac manicure with the Orly GelFX system. Hiatus refers to this as their “eco-gel” manicure. Per the Orly website, their gel lacquer contains antioxidant vitamins A and E to promote healthy nails and pro-vitamin B5 to help strengthen the nail. 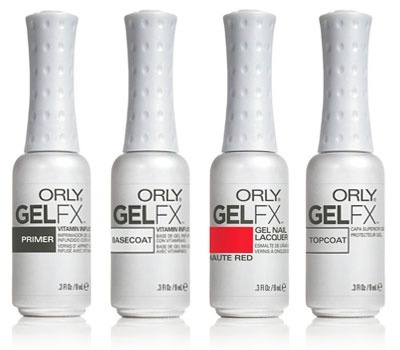 Also, the Orly GelFX cures with LED light rather than UV light used in shellac, which is a plus. At Hiatus, the gel manicure is a $19 add-on to their spa manicure, or $55 for non-members. In May, I opted for the Essential Mani-Pedi Retreat plus eco-gel add-on to give this gel polish business a try. The process is a little longer than your usual manicure, because you have to cure the nail lacquer with the LED lamp. In the case of the color I selected, Monroe’s Red, the nail technician had to cure each nail one at a time for each coat. It’s a painstaking process. First, they prep your nails like normal, then there’s a primer applied, then a base coat, then two coats of nail lacquer, and finally a top coat. And because of the gel quality, extra special attention is paid to not get this on your cuticles. I was told that the manicure should last up to two weeks. The Good: There is much to love about the gel manicure. 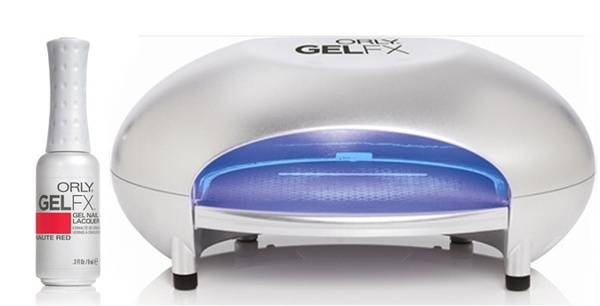 Because of the LED light curing process, your nails are instantly dry. No more worrying about messing up your freshly painted nails! And your nails are super shiny, and they stay that shiny for the duration of your manicure. And for the part that you’ve all been waiting for, yes, it does last for a really long time. I kept my gel manicure in tact for 10 days. The Questionable: Generally speaking, compared to traditional nail polish, the gel manicure doesn’t chip. That being said, one week after having it done, I had one nail that chipped. However, I think that had more to do with the application of the lacquer to that one nail rather than a fault of the product. At that point, I went to Hiatus, and the nail technician redid my one nail at no charge. Technically, you’re supposed to have the gel nail lacquer soaked off, which comes at a charge at the salon. In my case, the lacquer began to lift off the corners of my nails at about 10 days in, and then I was able to fairly easily peel the polish completely off. I know it’s not the recommended method, because it can be damaging to your natural nails, but it worked for me. So take this as one of those “do as I say, not as I do” moments. The Verdict: My nails grow fast. As you can see from my photos below that were taken on day 10, I had a pretty noticeable gap between my cuticles and the nail lacquer. (My middle finger is the one I had redone, so it doesn’t look as grown out as the other nails.) For me, it’s not very realistic to wear a gel manicure for two weeks, because I’d have polish starting halfway down my nails. Not a desired look. And I’m so used to doing my own manicures that I would never want to go into the salon so often, regardless of the cost. HOWEVER, for that 10 days of shiny, chip-free polished nails, I think the shellac/gel manicure craze is worthy of its buzz. Currently, I’ll do a full blown manicure with traditional nail polish, and after 3 to 5 days, I’m touching up nails here and there. OPI just launched their own gelshine At-Home Gel Colour System, and I’m dying to try it. I think I’ve got the manicurist skills and patience to do a gel manicure myself. The thought of keeping shiny, polished, no-fuss, no-muss nails for a week and a half is very appealing. My birthday is tomorrow… who’s buying it for me?? Okay, back to business … if you’re someone who already goes to the nail salon regularly, then I’d say the gel or shellac manicure is an upgrade worth considering. I think it’s an especially good option if you’re going on a vacation. 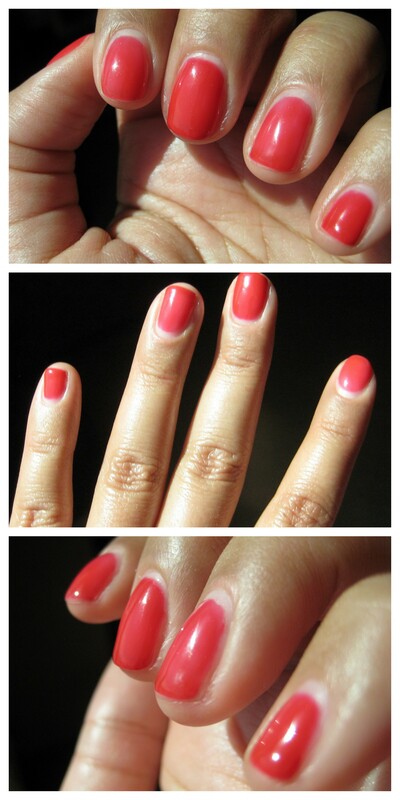 You’ll keep a fresh looking manicure for a longer time, because chipped nails are not cute. This entry was posted in Vanity and tagged gel nails, nail lacquer, nails, no chipping, Orly, Orly GelFX, polish, shellac on June 26, 2012 by jenn. Thanks for the informative review! Prior to my recent wedding, I considered shellac. In spite of my expert googling skills and diligence as a researcher, I found few unbiased and detailed reviews. I opted not to do it because of the UV light. (If nothing else I learned from you it’s that a girl has to take care of her hands.) Sounds like this is a great alternative; I can’t wait to try it! I think I’ll try this out, but my nails grow fast too, so I won’t use it regularly. Thanks! And I do think this manicure is best for special occasions.